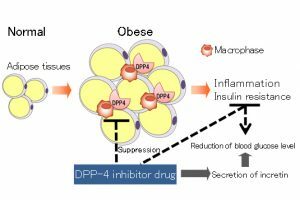 It is discovered that DPP-4 (dipeptidyl peptidase-4) inhibitors, most frequently used for treatment of diabetes in Japan, exert the actions, so far unknown, to attenuate obesity-induced inflammation of adipose tissues and insulin resistance. The new results concerning DPP-4 inhibitors indicate not only fundamental functions to stimulate insulin secretion but effects to attenuate insulin resistance. It is thus expected that DPP-4 inhibitors may be effective against the type 2 diabetes with obesity, which has been difficult to be treated. DPP-4 inhibitors have been administered to almost 4 million patients, more than half of all diabetes patients in Japan, after the release 6 years ago. Now, 9 types of DPP-4 inhibitors are available. DPP-4 inhibitors exert glucose lowering effects by augmenting the effectiveness of two types of gastrointestinal hormones, GLP-1 and GIP, called incretin. When administered solely, DPP-4 inhibitors do not induce body weight increment with quite low risk of low blood glucose level (hypoglycemia). DPP-4 inhibitors are, therefore, suitable as medication for type 2 diabetes, which is caused mainly by low levels of insulin secretion, found with many Japanese patients, so DPP-4 inhibitors have significantly changed the diabetes treatment in Japan. The target of the drug, DPP-4, is an enzyme that inactivates incretin by hydrolysis. It is also known to be a membrane-bound protein as CD26 on immune cells such as lymphocyte and macrophage. Therefore, DPP-4 has been reported to be a possible causative factor to make insulin resistance worse. The research team of Kanazawa University compared obese mice, fed with high-fat food, with control mice fed with lean food. The team found that the obese mice had a high level of DPP-4 in macrophages, which induce inflammation by migrating to adipose tissues from bone marrow, and that DPP-4 positive macrophages in fact caused inflammation of adipose tissues and made insulin resistance worse. Furthermore, the team has shown that administration of DPP-4 inhibitors to the obese mice reduced the accumulation of macrophages to adipose tissues as well as to liver and suppressed inflammation. Thus, the insulin resistance was attenuated. The mechanism of suppression of inflammation includes the inhibition of macrophage invasion upon adipose tissues as well as liver, induced by macrophage migration factor MIP-1α, a substrate of DPP-4 enzymatic reaction. These results of the current study show a possibility of new treatment for a larger number of the type-2 diabetes patients, since DPP-4 inhibitors are anticipated to attenuate insulin resistance and blood glucose level of the patients with low insulin secretion and of the obesity-related patients. It is now expected that effectiveness and safety of DPP-4 inhibitors should be reevaluated for patients of the type-2 diabetes with insulin resistance as well as for their effects on inflammation by clinical studies. This study was published in Diabetes, a scientific journal by American Diabetes Association and selected on the cover image of October issue of Diabetes . Left: Macrophage accumulation in adipose tissues of obese model mouse. Right: Superimposing the right and center figures indicates that most of the macrophages express DPP-4, i.e., DPP-4 positive macrophages. Grants-in-aid for Scientific Research 25282017 and 15K12698 from JSPS, MEXT, and Boehringer Ingelheim Pharma GmbH & Co. KG grant.